Chia is the highest plant based source of omega-3, dietary fibre, protein and antioxidants. Black and white Chia seeds are nutritionally identical, differing only in the colour of their seed coat. If Chia seeds appear brown however it’s an indication of immaturity and low nutritional quality. We guarantee the nutritional profile of every Chia seed we produce. We let our Chia ripen naturally in the sun and using gravity fed irrigation to ensure our crops grow to the best of their ability. The protein in Chia contains all eight essential amino acids, making it a ‘complete’ protein. This is incredibly rare for a plant based source of protein. Amino acids are essential for healthy muscles, hair, skin and nails. Omega-3 is a vital nutrient for brain function and overall health and vitality, while Chia’s high levels of both soluble and insoluble fibre can aid digestion. Our Chia seeds are a gluten-free whole food, too. The term ‘whole food’ refers to foods that are unprocessed and unrefined. Chia is one of few grain-like seeds that can be eaten completely in its natural state – no grinding, no cooking and no processing. Whole foods are beneficial as they contain high concentrations of complex micronutrients, antioxidants, fibers and many other phytochemicals which are often missing from processed foods. There are two types of dietary fibre and each plays a vital role in our health. ‘Soluble’ fibre, of which Chia contains 20%, dissolves in water, swelling to form a gel-like substance. This form of fibre has many benefits, including moderating blood glucose levels and lowering cholesterol. ‘Insoluble’ fibre, which makes up the remaining 80% of Chia’s fibre content does not dissolve in water and actually remains close to its original form throughout its path in the digestive system. Chia contains a type of Omega-3 fatty acid known as ALA. This kind of Omega-3 is particularly important to the heart and helps to maintain proper artery function, thereby helping reduce cardiovascular disease. 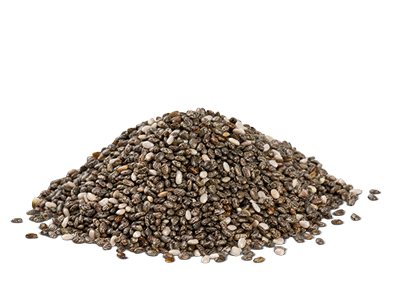 Our Chia seeds also contain Omega 6 LA, which assists in healthier skin. Some of the Omega-6 in Chia will be converted to Gamma Linolenic Acid (GLA) and Arachidonic Acid (AA), which, according to research can be beneficial for anti-inflammation, joint mobility and heart function. We farm Chia sustainably, in the perfect environment. Our Chia grows with the ideal climate, soil and water, and is sun ripened to produce seeds of the highest nutritional quality. We guarantee the nutritional quality as we grow it ourselves. We choose our farm locations carefully, working with the world’s best farmers and utilising advanced, precision farming techniques. We manage a fully transparent supply chain, and can trace every packet of our Chia seeds back to the paddock it was grown in.